Digital High Pressure T-Shirt Press in size 8x8" (HT-0808B), 15x15" (HT-1515C), 16x20" (HT-1620C), and 16x24" (HT-1624C) - for making custom t-shirts, pet clothes, tote bags, hoodies, etc. Digital Hat (or cap) Press in swing open style (HT-CP02) and clamshell open style (HT-CP03) - for making custom heat transfers to hats or caps, as well pet clothes, sleeves, hoodies, cloth labels, etc. Digital 4-in-1 Multifunction Heat Press with t-shirt press size 12x12" (HT-4001K) and 15x12" (HT-4001N) - with interchangeable t-shirt press, hat press, mug press and plat press units for making custom heat transfers to t-shirts, caps, mugs, plates, etc. For replacement parts for our heat presses, order below. For accessories for heat transfers, you can order them on the Heat Transfer Supplies page. More package deals are available on Specials - Hot Package Deals page. This t-shirt press can be used for heat transfer of images to small size T-shirts, pet clothes, tote bags, hoodies and any other objects with flat surfaces and within certain height. The press size 8x8" is ideal for small sized image transfers. Note: Every new press comes with one free Teflon sheet (wrapped to the top platen). Plate size: 8" x 8"
Package size: 25 x 19 x 15"
This t-shirt press can be used for heat transfer of images to T-shirts, tote bags, hoodies, mouse pads, tiles and any other objects with flat surfaces and within certain height. The press size 15x15" is ideal for small to medium sized image transfers. Plate size: 15 x 15"
Package size: 29 x 19 x 18"
This large size t-shirt press can be used for heat transfer of images to T-shirts, tote bags, hoodies, mouse pads, tiles and any other objects with flat surfaces and within certain height. The press size 16x20" is ideal for doing almost all sized image transfers. Plate size: 16 x 20"
Package size: 31 x 27 x 18"
This large size t-shirt press can be used for heat transfer of images to T-shirts, tote bags, hoodies, mouse pads, tiles and any other objects with flat surfaces and within certain height. The press size 16x24" is ideal for doing almost all sized image transfers. 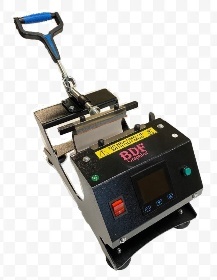 BDF hat presses are ideal for heat transfer of designs, graphics and photos to hats, caps that are made with cotton, flax, polyester and mixture of these materials. Besides, it can also be used make transfers to small garments (such as baby clothing, dog clothing, hood, sleeves) or irregular shaped objects such as bags, travel pouches, etc. Plate size: 5.5 x 3.15"
Package size: 23 x 19 x 17"
This hat press is open in a clamshell style. This style allows user to do straightforward transfers without constant adjusting the pressure of the press. 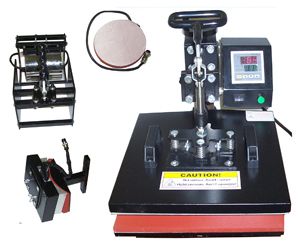 Just like our swing-away style hat press, it can be used for heat transfer of designs, graphics and photos to hats, caps, sleeves, hoodies, baby clothing, pet clothing, etc. BDF mug presses are ideal for heat transferring designs, graphics and photos to mugs, cups, water bottles and other cylindrical objects. It can be used with any suitable heat transfer papers, including any sublimation transfer papers and Neenah's Techni-Print HS laser transfer paper we carry. To order heat tape, Teflon sheet, heat resistant foam pads, etc., please go to the Heat Transfer Supplies page. Maximum heating area 9 x 4.5"
Package size: 14 x 13 x 10"
This 4-in-1 heat press is a multi-function heat press for heat transfer of images to T-shirts, mugs, caps and plates. 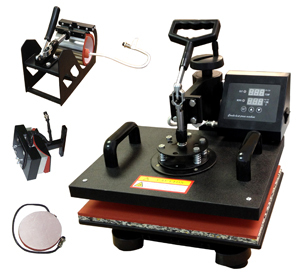 The combo press includes 12x12" T-shirt press, mug press, cap press and 5" plate press, which can be easily interchanged for a particular job. It is an economical solution for all purpose commercial applications. Note: Every new press comes with one free Teflon sheet (wrapped to the top platen of the flat press). Package size: 21 x 19 x 19"
This 4-in-1 heat press is a multi-function heat press for heat transfer of images to T-shirts, mugs, caps and plates. The combo press includes 15x12" T-shirt press, mug press, cap press and 5" plate press, which can be easily interchanged for a particular job. It is an economical solution for all purpose commercial applications. Most heat presses (including our mug press, plate press and multifunction presses) use replaceable heating element with standard connector to the controller. We carry spare heating element units that can be easily mounted to your press if it accepts the standard connector. For use with other brand heat presses, please make sure the compatibility, especially the connectors (from the controller box to the heating element), although most replaceable heating elements use standard connector to the controller. We do not guarantee any compatibility if your press is not ours. If the parts you are looking for are not listed here, please contact us by email or phone call. You can order them on the Heat Transfer Supplies page.